© Provided by CBS Interactive Inc. 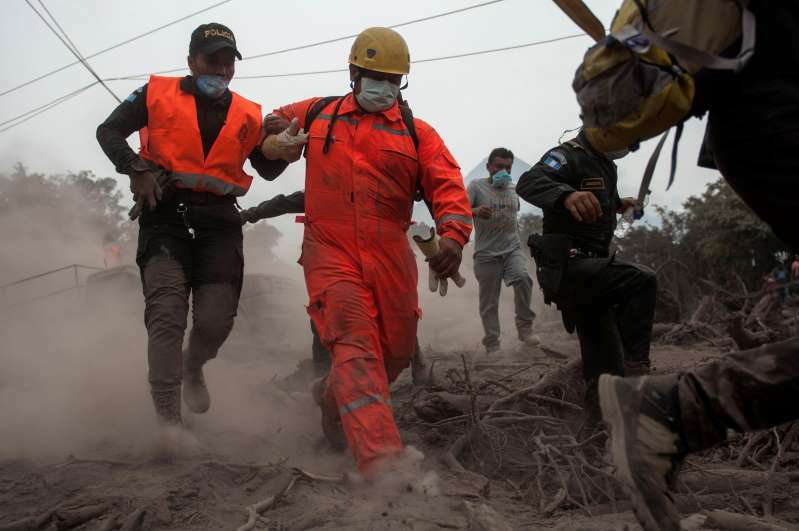 Firefighters and police are forced to evacuate a search and rescue effort as the Volcan de Fuego, or "Volcano of Fire," continues to spill out smoke and ash in Escuintla, Guatemala, Monday, June 4, 2018. A disaster is unfolding in Guatemala, where the Volcano of Fire has erupted, forcing nearby residents to run for their lives with no warning. Ash and mud hot enough to melt shoes has buried homes and people. Rescuers have pulled at least 10 people to safety. More than 62 people have been killed and the toll is expected to rise. More than 46 were hurt and more than 3,200 were evacuated. Orange superheated gas and rocks shot into the sky and poured down the mountain reportedly wiping out entire villages. The eruption sent ash as far as 40 miles away. In the first few hours, the ash and mud remained so hot that rescuers had a difficult time reaching victims, some of whom could be heard crying out for help. The rapidly moving mixture of gases and volcanic matter -- known as pyroclastic flows -- reached 1,300 degrees Fahrenheit in some places. By the time first responders did reach them, it was often too late. Dozens were either burned to death or asphyxiated by the deadly fumes, including children.